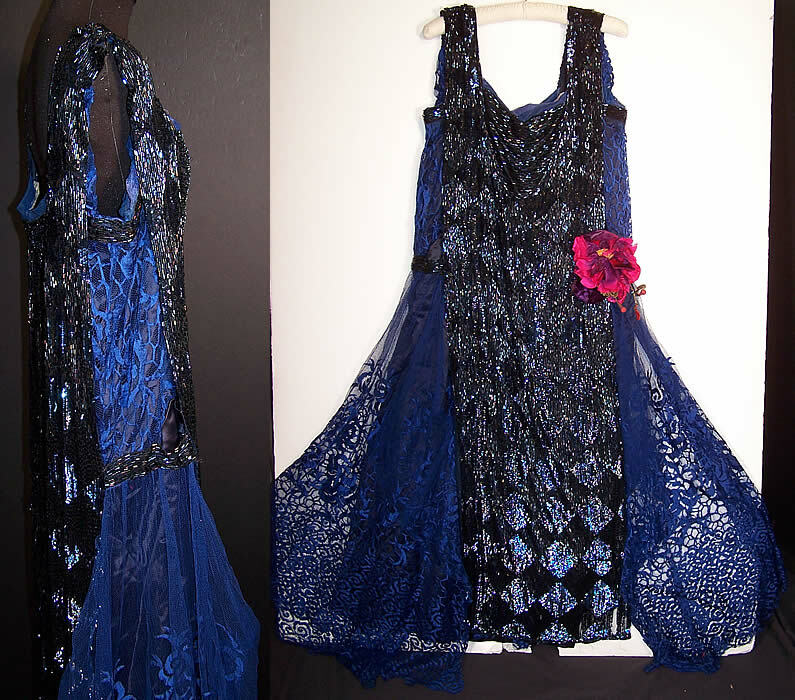 This amazing vintage Art Deco black beaded blue sequin lace flapper gown dress dates from the 1920s. 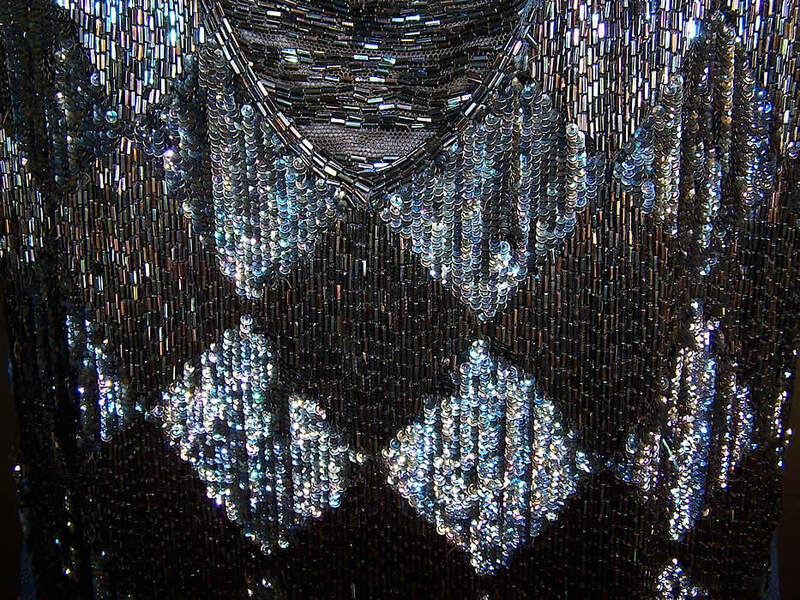 It is made of black net completely covered with black beading and iridescent blue sequins done in an Art Deco abstract geometric diamond pattern design. There are bright royal blue silk lace tulle net panels along the sides and a bright pink fuchsia silk flower trim with gold mesh accents. 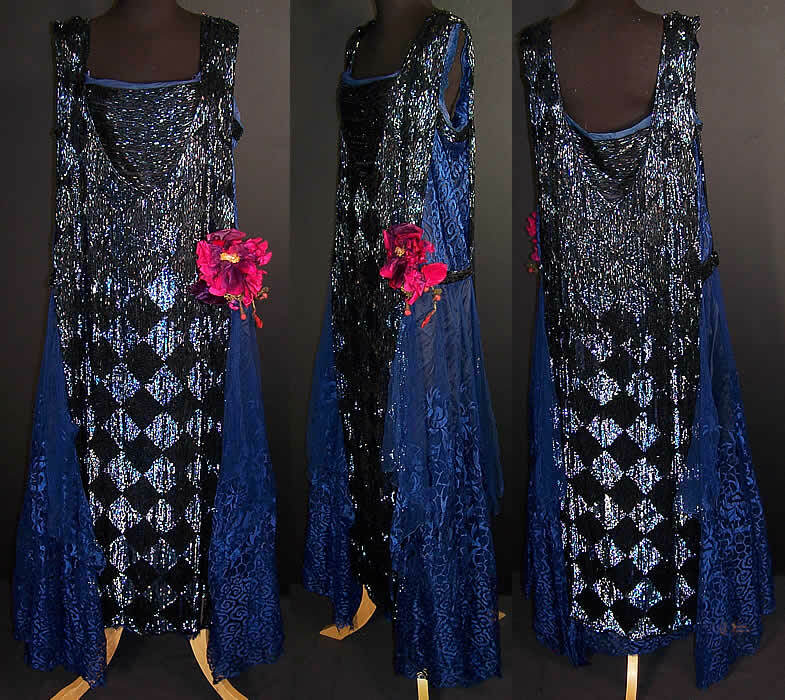 This fabulous flapper dress evening gown is loose fitting, with squared necklines, sleeveless, a long skirt with draping flared side skirt panels and snaps for closure. It is fully lined in a black silk satin fabric, with a weighted bottom hemline, a white silk camisole lining the top and a "Donovan N.S. 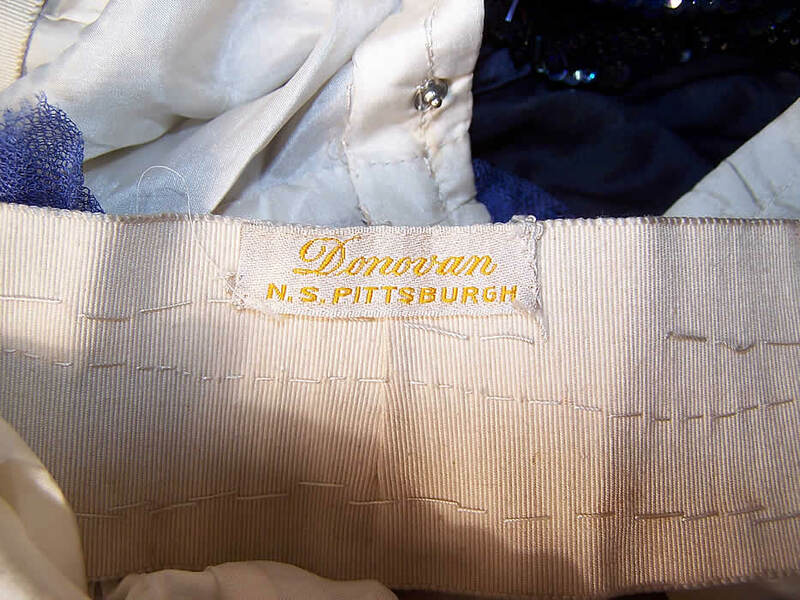 Pittsburgh" label sewn inside the waistband. This magnificent dress is quality made, with wonderful workmanship, design details and is very heavy weighing almost 5 pounds. The dress measures 51 inches long, with a 40 inch waist and 36 inch bust. It is in excellent wearable condition, with only a few missing loose beads which is difficult to see. 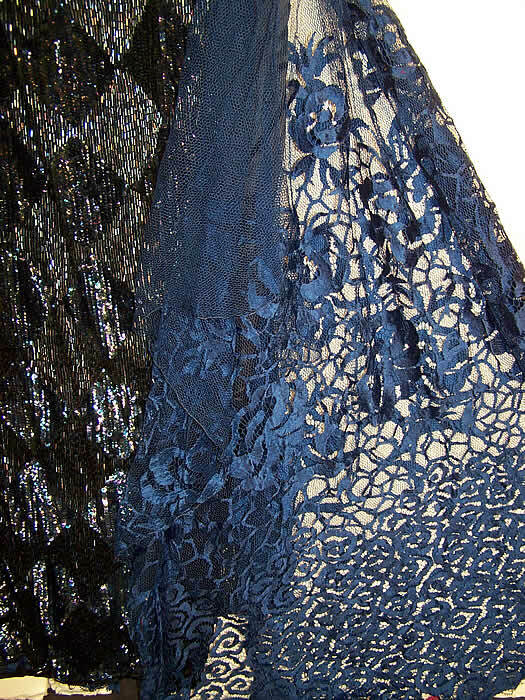 There are a few small holes in the blue silk lace side skirt panels. 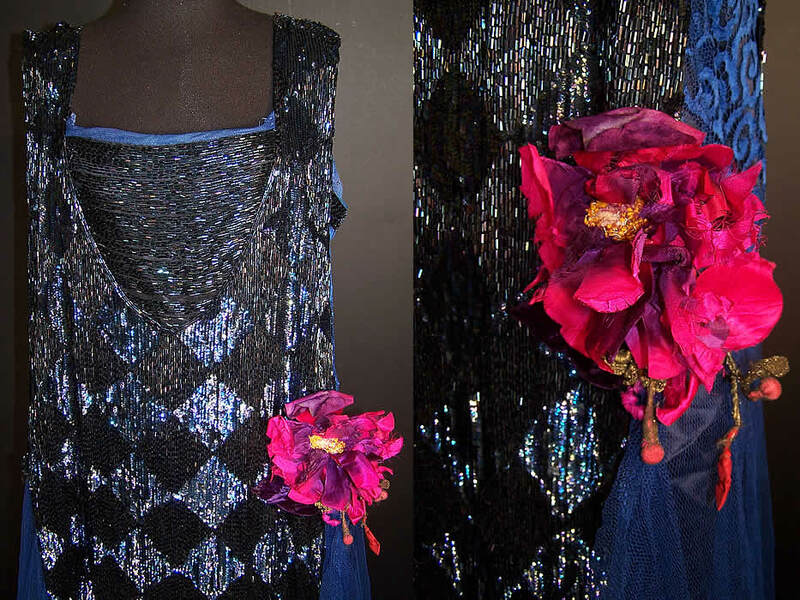 This is truly a rare and exceptional piece of wearable Art Deco beaded textile art! It's a wearable size! The colors are fabulous as well. Really, I almost like this more than the orange one I posted a few months ago.